Well, today I'm off to Salt Lake City for convention but wanted to share one more of my swap cards before I go. I saw this sketch on a friend's blog but when I went to credit her, I can't find it. I'm really aggrevated because I want to give credit where credit is due. So, if you see this and know this is your sketch, please email me so I can give you credit for such a great sketch! This card uses the new In Colors of Kiwi Kiss and Pacific Point. 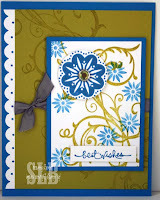 It also uses the new Scallop Border punch. All of these items will be available beginning August 11th! This is one of my "go to" sets. I love the colors and the white scalloped edge.